The Eighteenth Judicial District Commission on Judicial Performance unanimously recommends that Judge Gerald J. Rafferty BE RETAINED. 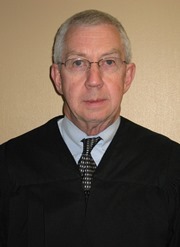 Judge Rafferty has served as a district court judge in the Eighteenth Judicial District since 1999. He earned a bachelor’s degree from the U.S. Air Force Academy in 1967, and served as an Air Force pilot from 1967-1977. He was a special agent in the FBI from 1973 to 1977, following which he earned a law degree with honors from John Marshall Law School in 1978. From 1978 to 1988, he was a federal prosecutor in the U.S. Attorney’s Office, then worked with a Denver law firm until 1989, when he returned to the Denver District Attorney’s office. He was appointed to the district court bench in 1999, where he currently has a 70% criminal and 25% civil docket. Judge Rafferty gives back to the community in many ways: he has conducted mock trials for a social studies class at Arapahoe High School for the past 10 years, and speaks frequently about the judiciary to civic groups and high school students. Each year he addresses incoming criminal justice students at Arapahoe Community College, and twice a year he organizes blood drives at the Arapahoe County Courthouse. One criticism of Judge Rafferty is that cases in his courtroom can be a bit slower than those before some other judges. Made aware of this issue, Judge Rafferty is now ruling more quickly on probation violations. The Commission finds that Judge Gerald Rafferty is a sound and experienced judge who should be retained on the bench.